If you can’t find enough amazing deals on Intimidation Clothing products at IntimidationClothing.com, then try checking out our online dealer at CarnalDaMMAge.com. The Reno, Nevada-based fight shop always has deals available and caries a wide variety of Intimidation products and was the first retailer to carry Intimidation’s Support Local MMA t-shirts. A long-time retailer of the Intimidation brand, the folks at CarnalDaMMAge.com are serious about their business. Run by a team that is dedicated to servicing customers first, they take pride in their work and their business is powered by fight fans, trainers, and fighters. Founded in 2009, CarnalDaMMAge.com aims to cater to the MMA fan, supporter, fighter and enthusiast and carries a huge variety of MMA brands. Interested in becoming a dealer of authentic Intimidation Clothing products? 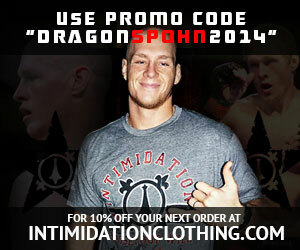 We’d be glad to feature your company as well here at IntimidationMMA.com. Contact Intimidation today on Twitter or email us at info (at) intimidation-clothing.com.